Home page > Public directory > Indian Politics > Sangh Parivar / Hindu Nationalism > Communalism > Gujarat > Probe or persecution? Muslims in Ahmedabad bear the brunt of the investigation into the assassination of former Gujarat Home Minister Haren Pandya. THEY did not expect a showdown at a memorial prayer meeting. So, when Vithalbhai Pandya said that his son Haren’s assassination on March 26 was "a political murder", Bharatiya Janata Party leaders were red in the face. Deputy Prime Minister L.K. Advani had to admit that an injustice had been done to the slain leader. Haren Pandya was former Home Minister of Gujarat and Chief Minister Narendra Modi’s most fierce opponent in the State BJP. The next day, Advani flew back to Delhi and announced that Pakistan’s Inter- Services Intelligence (ISI) and underworld don Dawood Ibrahim were involved in the killing. The Central Bureau of Investigation (CBI) had barely started work on the case. 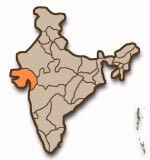 Since then, Ahmedabad’s Muslim areas have faced the brunt of the `investigation’. In the middle of the night, homes are raided in search of `ISI agents’. Soon after Advani’s prophecy, on April 3, the Crime Branch of the State Police arrested five suspected ISI-trained terrorists, who were allegedly involved in the plot to kill Haren Pandya. Soon after, the CBI arrested five more in Andhra Pradesh. Of them, Asgar Ali is allegedly the one who pulled the trigger. In all, the CBI has arrested eight persons from Andhra Pradesh. While the CBI has not yet charged the accused under the harsh Prevention of Terrorism Act (POTA), the Crime Branch of the Gujarat Police has remanded the 10 alleged ISI agents arrested by it under POTA and is waiting to book those in CBI custody as well. The Ahmedabad Police say that the mastermind, Mufti Ahmedmiyan Sufiyan Patangiya, is still at large. He was apparently coordinating with Rasool Parti, now in Karachi, who was once part of the Latif gang in Ahmedabad. "The CBI is handling only Haren Pandya’s killing. Our case pertains to a larger conspiracy to destabilise the country," said a Crime Branch official. "Three of the accused were trained in Karachi. They went there in December via Calcutta and Dhaka and returned on March 8. They were sent by Sufiyan. They are all part of a bigger terrorist network involved in many other crimes," the official said. However, all the 10 accused arrested by the Crime Branch are connected with the Haren Pandya case. The Crime Branch seems to be working parallel to the CBI, but only in a more repressive manner. The raids and arrests have instilled fear in Ahmedabad’s already petrified Muslim community. "They bang on the doors in the middle of the night, barge into homes, rummage through the residents’ belongings and arrest people without giving their families any information," says Nazneen Bastawala, a corporator from Kalupur, Ahmedabad. She organised a protest by women whose sons and husbands have disappeared. Bastawala claims that the police have detained more than 25 men illegally. There is no record of their arrest. "For days, we didn’t know where they were. A week later, the police released them. Luckily, the police let off many without filing false cases against them," said one of the women. When the police came looking for Arif’s (name changed) younger brother Salim (name changed), he was not at home. So, instead they arrested Arif, his father and another brother. "They wouldn’t let us go until we told them where Salim was. But I really didn’t know where he had gone. The interrogations were like mental torture. They let my brother go home after two days. My aged father, who has a heart problem, fell unconscious twice. But they weren’t bothered," says Arif. Arif and his father were released after a week. But Arif was re-arrested because he was not able to trace Salim. "They even sent me to Mumbai to look for Salim. But they arrested him in Ahmedabad on the day I left for Mumbai," says Arif. Several people narrated similar stories about brothers or fathers being arrested illegally. The raids continued until the end of the month. Women went rushing to lawyers asking them to help trace their husbands. Those who traced their sons and husbands in custody are afraid that they could be killed in fake encounters, a well-known technique of the Gujarat Police. The most recent "encounter death" was that of Samir Khan Pathan, accused of plotting to assassinate Narendra Modi. He was apparently taken to the site of a crime he had committed previously, and was killed while he allegedly tried to escape. On April 30, Faqruddin Yusuf Sikligar, an accused in the Godhra case, died in custody. The police say he was suffering from low blood pressure. "Why are all Muslims branded terrorists? Why is POTA applied only to the Godhra accused and now to these youth? Why not against those who killed so many during the communal massacres in Naroda Patiya and Gulbarg society? Why are they out on bail? Why is there selective justice?" asked one of the women who protested against the arbitrary arrests. A telling comparison, indeed. After the charge-sheets of the riot cases were filed, several witnesses went to court stating that their testimonies were ignored or recorded wrongly. They asked for their statements to be recorded properly by the police. Moreover, riot victims from Naroda Gaam, who testified to the role of Vishwa Hindu Parishad (VHP) leader Dr. Jaideep Patel and other BJP leaders, were jailed six months later in a separate murder case. Even Haren Pandya’s family is wary of the arrests. "I am of the firm opinion that this was an intentional political murder. This talk of a terrorist plan is absolutely absurd," said Vithalbhai Pandya. "The day after I said at the condolence meeting that it was a political murder, Advani announced that the ISI and Dawood Ibrahim were involved. The CBI inquiry had just begun. We have faith in the CBI. But when a responsible person makes an immature statement, it can derail the inquiry," he said. On the arrests, he said, "The murderer may have killed because of money. But the real political culprit must be arrested. No real inquiry can be made until the person in power steps down. They are making arrests just to show people that action is being taken. Everyone understands what is happening. But no one can speak." Ironically, the dreaded `terrorists’ seem to keep coming to Narendra Modi’s rescue. His campaign promise to wipe out terrorism from Gujarat helped him win the elections. Now, the arrests of `ISI terrorists’ seem to be easing him out of an embarrassing situation. 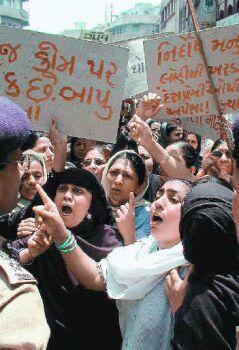 Pic 1: The Muslim Mahila Sangathan members demonstrate against the Prevention of Terrorism Act in Ahmedabad on April 26. 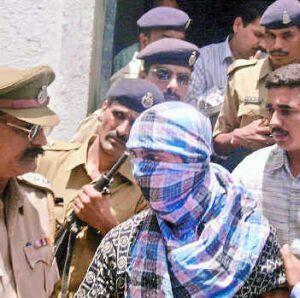 Pic 2: SIDDHARTH DARSHAN KUMAR/AP ; One of the three accused in the Haren Pandya murder case, in police custody on April 29. 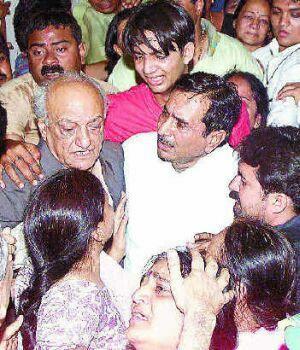 Pic 3: Vithalbhai Pandya, father of Haren Pandya, with relatives at a hospital in Ahmedabad on the day of the murder. in Frontline, volume 20 - Issue 10, May 10 - 23, 2003.